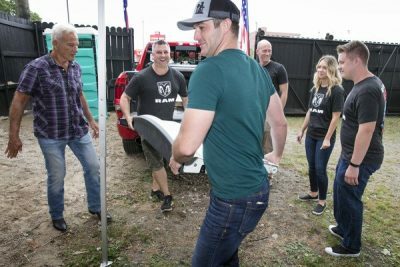 Mercury Nashville recording artist Easton Corbin, an ardent supporter of the military and veteran organizations, spent Friday afternoon assisting members of Ram Nation as they helped renovate the courtyard at the headquarters of Vets Returning Home in Roseville, MI. 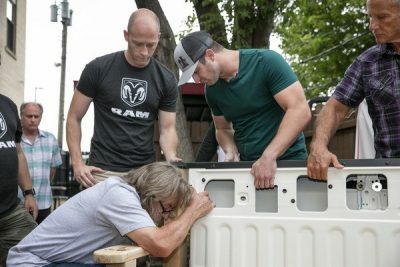 Ram Nation is a grassroots volunteer corps of Ram owners who are ready to help communities. Vets Returning Home offers transitional services to veterans returning from conflict. 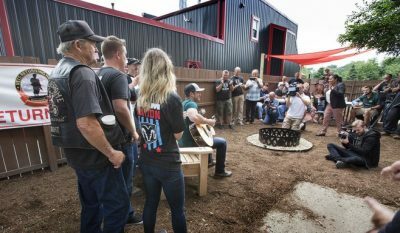 After completing the courtyard renovation, Corbin met with the veterans and performed some of his hits including his current Top 30 single “A Girl Like You,” from his upcoming fourth studio album. Country Music News Blog participates in advertising programs that help fund the operation of this site. For more information please visit our privacy statement. 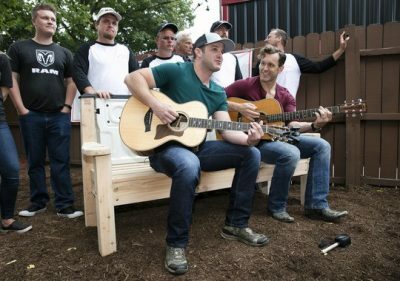 This entry was posted in Community, Easton Corbin, Press Releases by Shauna "WhiskeyChick" Castorena. Bookmark the permalink.